The first High-Frequency Desiccator with Cut. One half of the unit is a high-frequency desiccator, The other half is a Bovie Generator, giving 60 watts of cutting power and coag capabilities – plenty of power for LLETZ/LEEP or most any cutting procedure performed in the doctor’s office. Cost Effective - No grounding pad required when working in the desiccation mode. The left half of the unit is a Bovie generator. 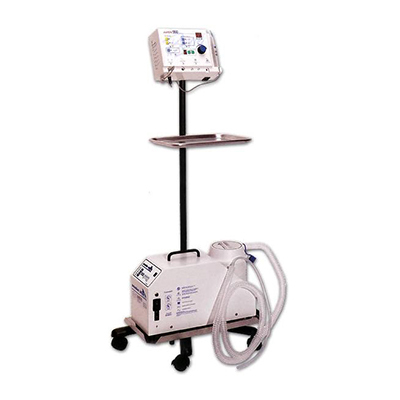 It is a floating ground unit that requires a return electrode pad to be used. This isolated power feature helps to ensure your safety as well as that of the patient. The Bovie Generator offers you up to 60 watts in Cut mode, Blended Cut mode, and Pinpoint Coagulation mode. Simplicity is achieved using easy-touch, color-coded membrane pads, and by placing all user controls and outputs on the unit’s compact front panel. The ergonomic arrangement of commonly used operating functions, plus a large, comfortable rotary dial, provide quick operating-mode selections and smooth power adjusting with the option of adjusting the power from the handpiece. The six available presets labeled “A-F” allow the user to record often used settings for one-touch recall. Each preset stores the mode selection and power setting for one operating mode. Use of the Aaron 950 promotes procedural confidence. Our surgical handpiece fits comfortably in your hand and, when not in use, rests conveniently in a holder specifically designed to minimize contact with the unit. The handpiece holder safely isolates the instrument from the medical team, the patient, and the unit. All industry-standard 3/32" (0.24 cm) disposable and reusable electrodes fit the 950 handpieces. Handpieces may be autoclaved for greater operating efficiency and maximum cost control. 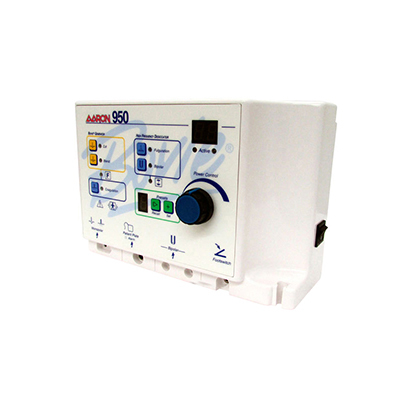 Aaron 950 post-procedure cleanup is simple (and fast) due to nonabsorbent ABS enclosures, and our use of liquid resistant membrane switches that can be wiped clean with a damp cloth. 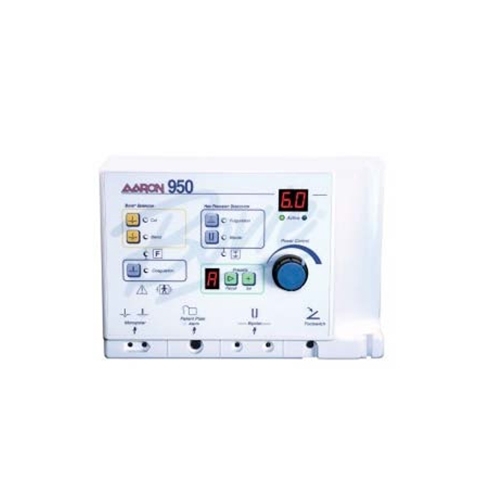 The Aaron 950 allows the doctor to change the power setting with one action, using the rotary power-control dial or the up/down buttons on the autoclavable handpiece. This saves time and protects the sterile field during sensitive procedures. To use the foot control feature one simply needs to plug in the optional footswitch. There is no expensive separate handpiece, and the handpiece retains the ability to adjust the power and activate the unit in this mode. The Aaron 950 has a technology advantage right in the handpiece: a superbly engineered collet that’s even gold plated for superior conductivity and holds electrodes securely in place. The buttons on the handpiece have been designed for superior tactile feel and comfort, and the entire handpiece is molded into a comfortable grip. Finally, it’s autoclavable so you can have sterility when you need it, and an easy to clean and durable handpiece all the way around. Digital error detection means unsurpassed safety for you and your patient. Aaron 950 continuously monitors every aspect of the unit’s output. At the sign of any problem the machine instantly disables the output and displays the appropriate error code on the display.